The time has been set for Interior Designer Chat with the hashtag #IntDesignerChat every Tuesday at 6pm, Eastern Time, 5pm Central Time, 4pm Mountain Time, and 3pm Pacific Time. Interior Designer Chat is unique and a needed stream around the Tweetosphere and Internationally in the fields of Interior Design, Interior Architects, and Home Decor Professions. This Chat is to help those of us in the Industry; Professionals, discuss topics we feel are relevant to the changing climate of today and our Industry. #IntDesignerChat is NOT for consumers. Our topics will be strictly of: To The Trade nature. We all have the same passion here, design and making things beautiful. We have already had a flood of emails asking us to discuss many economical related topics. 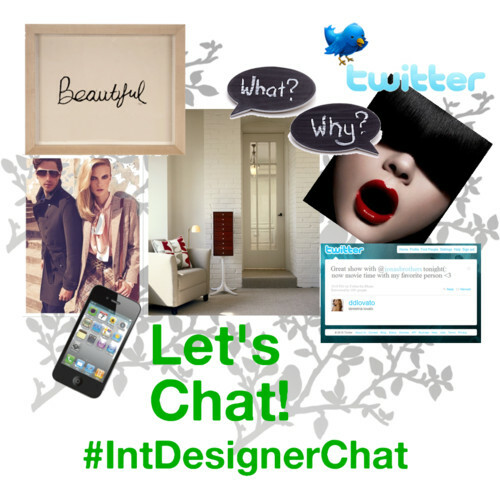 Keep them coming, as the #IntDesignerChat is a community based and led by the followers. Many people use Hootesuite or Tweetdeck in this case you will set up a column with the hastag- IntDesignerChat. Other wise the conversations can be on TweetChat. Remember, in each tweet please be sure to use the hashtag(#) so everyone can follow the conversations. We recommend tweetchat as the hashtag intdesignerchat is entered for you on every tweet. When in the chat, remember all participants are condensing thoughts to 140 char. so relax we all feel panic at first. With tweetchat you can slow the speed of the tweets. Locate the refresh button just below the tweet panel to your left. Join in any time, there is no formality here. We understand and will be just happy to see one tweet from you. Most of all #IntDesignerChat is about learning, sharing, and having fun. Make sure to follow Founder/Moderator @NoirBlancDesign Barbara Segal and the #IntDesignerChat announced Guest Host respected industry experts and leaders of the Chat. They will control the questions and discussion of the #IntDesignerChat. The institutional twitter account @IntDesignerChat will tweet instructions of the chat, questions and RT. It is important to follow all 3 off these accounts during the twitter chat hour. If @IntDesignerChat has a Guest Host their twitter account is announced to follow as well. They will control the questions and discussion of the #IntDesignerChat.